Russia's first crisis will be a social one: a demographic collapse of the Slavic population, gutted by alcoholism, early death, and abortions that historically have outnumbered live births. Filling the void is a rising Muslim population, including radical Islamists who seek to subvert the nature of the Russian state. In the background is an emerging strategic rivalry with neighboring China, which has growing designs on Russia's resource-rich east. 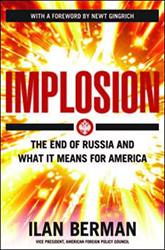 Ilan Berman paints a grim picture of Russia's precarious future, how the former superpower might unravel, and what impact the end of the Russian state as we know it would have on America.